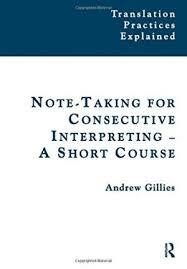 245 1 0 %a Note-taking for consecutive interpreting : %b a short course / %c Andrew Gillies. 260 # %a London ; %a New York : %b Routledge, %c 2014. 300 %a , 239 s. : %b il. ; %c 25 cm. 504 %a Bibliogr. s. 235-237. Indeks.